NASA's Cold Atom Laboratory utilizes a magnetic trap that confines particles, allowing them to cool to temperatures just barely above absolute zero. The icy chill of empty space will soon be trumped by the temperatures aboard the International Space Station. Using NASA's Cold Atom Lab, scientists plan to reach temperatures only a few degrees above absolute zero on the station, allowing them to study challenging aspects of quantum mechanics. "We're going to study matter at temperatures far colder than are found naturally," JPL's Rob Thompson said in a statement. Thompson is the Project Scientist for the Cold Atom Lab, an atomic 'refrigerator' planned to make the orbiting laboratory its new home in 2016. You can watch a video describing NASA's Cold Atom Lab experiment here. When atoms of rubidium and sodium reach temperatures near absolute zero, they, they behave as both particles and waves, merging into a single wave of matter. Known as Bose-Einstein Condensates (BCEs), the new material was predicted by both Albert Einstein and Satyendra Bose in the early 20th century. Mixing two BCEs isn't like blending ordinary gases — the condensates instead behave like waves, interfering with one another so that two atoms combined together can result in no atom at all. "The Cold Atom Lab will allow us to study these objects at perhaps the lowest temperatures over," Thompson said. Researchers will also be able to mix super-cool atomic gases on board the space station. Atoms will float free of perturbations, which will allow for extremely sensitive measurements of the weak interactions that occur. 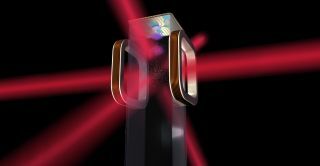 "This could lead to the discovery of interesting and novel quantum phenomena," Thompson said. The International Space Station is a prime location to perform such experiments because of lack of interference from the pull of gravity. A basic principle of thermodynamics is that gas cools as it expands. When gas is sprayed from a household aerosol can, the can cools because the remaining gas within it expands to fill the recently-vacated space. "On the ISS [space station], these traps can be made very weak because they do not have to support the atoms against the pull of gravity," Thomas said. "Weak traps allow gases to expand and cool to lower temperatures than are possible on the ground." Practical applications of the work done by the Cold Atom Lab include quantum sensors, matter wave interferometers, and atomic lasers. If the temperatures are low enough, researchers may also be able to assemble quantum wave packages as wide as the human hair — "big enough for the eye to see," according to Thompson. "We're entering the unknown," Thompson said.